The Annual Lawn Mower Race will be held on April 6th, 2019 and is hosted by John's Lawn Equipment. This event helps to fund support for individuals with intellectual and developmental disabilities. 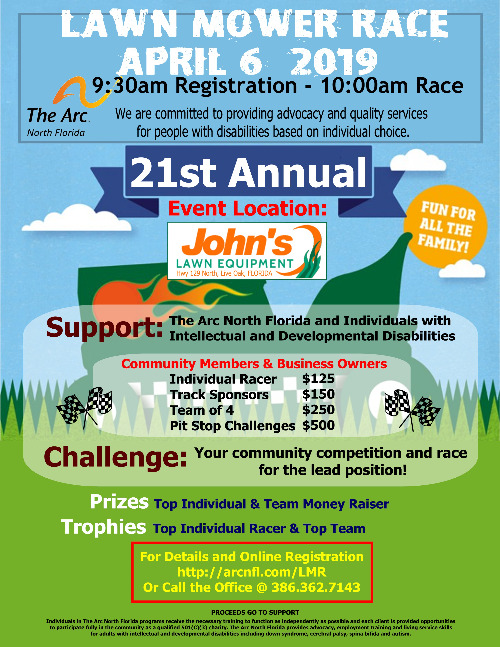 We are looking for sponsors and riders to come out in support of The Arc North Florida and those we serve. It's lots of fun for the whole family, and can serve as an advertisement opportunity for local businesses. This form stopped accepting submissions on April 6, 2019 12:00 am EDT.